This is a delicious and delicate ideal dessert to serve after a heavy dinner. The strawberry flavor is delicious and is a different way of eating this fruit. It’s so easy to do that will impress your family and so transform a simple night in an elegant and formal dinner. Delight your family with this delicious flavor. Mix gelatin with water and allow it to make solid. In a bowl mix the strawberry puree, heavy cream, milk and sugar, stir well until fully incorporated. Heat the gelatin for 30 seconds in the microwave and add to mixture. Place in ramequins and refrigerate for 4 hours. For the decoration of strawberries, cut into small squares and add 5 strawberries 1/2 teaspoon sugar. To unmold place ramequin in hot water, being careful not to touch the Panna Cotta, dump on a plate garnish and serve. Preparation time 4 hours and half. This recipe makes 4 Panna Cotta. 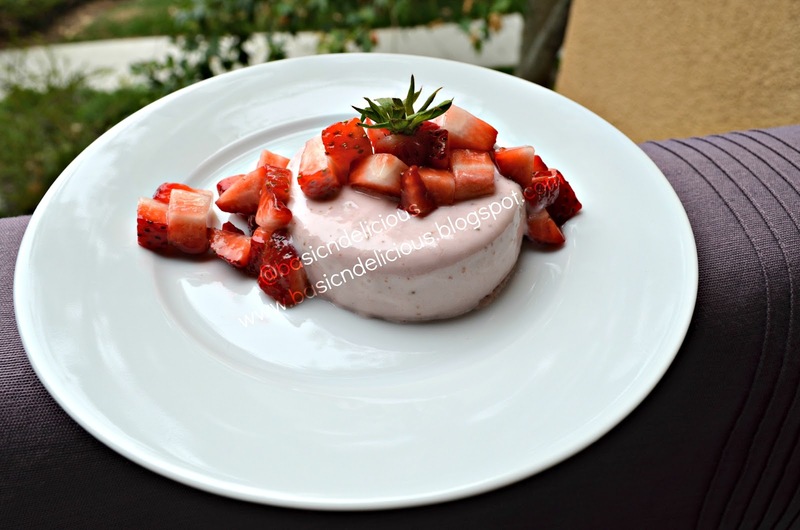 This entry was posted in Uncategorized and tagged cream, strawberry by Kathia Rodriguez. Bookmark the permalink.